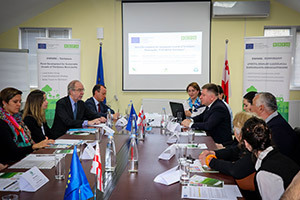 On 3 April 2019, an EU mission from Brussels led by John Clarke, Director of International Affairs, DG Agriculture, European Commission, within the EU ENPARD programme, visited an EU-supported rural development project implemented by the Association Rural Development for Future Georgia (RDFG) in the Tetritskaro municipality. At first, the EU mission met with the members of Tetritskaro Local Action Group (LAG) and RDFG. Afterwards, they visited the rural development project – a cheese factory in the village of Tsintskaro. “RDFG, as a rural development organization, strongly believes that multisectoral strategies for local development, led by empowered communities using a bottom-up approach, is a unique opportunity to improve the quality of life in rural Georgia by equipping rural populations with the necessary skills and resources. 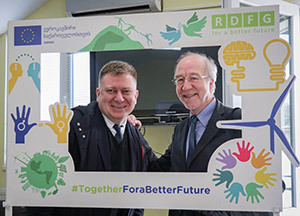 RDFG’s main priority is giving equal opportunities to all rural people, facilitating resilient communities and sustainable development in the face of a changing world, considering the challenges of climate change and globalizing markets”. In conclusion, Nino Tikurishvili, the executive director of LAG spoke about the organization’s activities and its key achievements. After the meeting, the guests visited the RDFG beneficiary cheese factory “Tsintskaro +”. The director of the factory explained the specifics of dairy processing and shared her plans for the business development with the EU support under the ENPARD project. The guests had an opportunity to observe the cheese making process and taste different varieties of cheese made at the factory. The cheese factory “Tsintskaro +” is one of the rural development projects implemented under the scope of EU ENPARD programme. Before getting funded, the factory had been producing only cheese but now it is going to produce “matsoni”, “do” and other Georgian dairy products. It is worth mentioning that all products in the factory are made of natural milk and have the relevant mark – “Georgian Milk”. Within the EU ENPARD programme, over 35 rural development projects in the Tetritskaro municipality, including the sectors of agriculture, infrastructure, tourism, education, social and municipal services have been supported by the EU and implemented by RDFG with a help of LAG. These projects facilitate creation of 180 permanent and 35 temporary jobs in Tetritskaro. The EU-funded project “Rural Development for Sustainable Growth in the Tetritskaro Municipality” is implemented by EU partner organisation, RDFG. The project aims to improve the quality of life in the Tetritskaro municipality through the introduction of innovative social-economic models and engagement of local private and public sectors in the decision making. RDFG is partnering with the Agro-Technology Association and the Lithuanian Local Action Groups Network to carry out the action.